Fireside Audiobox launches on Kickstarter | What Hi-Fi? Grey Street Design's Fireside Audiobox is a Bluetooth enabled speaker attached to a propane canister. According to designer Tyrone Hazen, the device maps the audio waves of your music and identifies the spots along the wavelength that would create the "most responsive and dramatic flame effects". 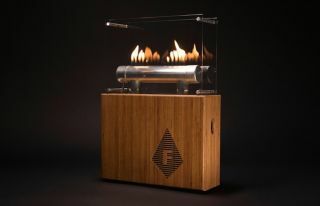 The science of the Fireside Audiobox is based on a "Rubens' tube", a device that graphically shows the relationship between sound waves and sound pressure. Measuring 50cm high, 35cm wide and 11.5cm in depth, the speaker has an onboard Li-po battery that can provide a claimed eight hours of music, which is also the average length of time that the 16.4oz canister lasts. If you want to find out more, or get your hands on one of these devices, the Fireside Audiobook is currently being funded on Kickstarter between now and 26th August.